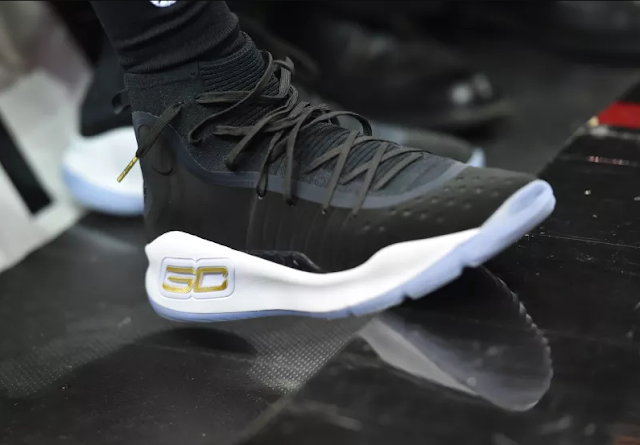 Stephen Curry debuted the Under Armour Curry 4 in an all-white colorway with an icy blue sole and gold detailing during Game 1 of the 2017 NBA Finals. It's arguably his best looking signature shoe to date. During the NBA Finals practice before Game 3, Curry unveiled another colorway of the shoe. The shoe is donned with an all-black upper, white midsole, gold logo detailing, and an icy blue sole. No release date is set for this colorway, but the model is set to debut at retailers in October, according to Sole Collector. The Golden State Warriors take on the Cleveland Cavaliers for Game 3 on Wednesday night. We'll see if Steph rocks this particular pair.